Screening for Vulnerable Myocardium:What are Preceding Triggers of a Fatal Arrhythmia? Topic:Clinical Characteristics of Pre-Symptomatic Vulnerable Patients; Are There Different Types? Topic: An Integrated and Cost-Effective Approach to Screening: Is it possible? due to upcoming publication (**). Special thanks to Drs Michael Jamieson(Pfizer) and Krishna Sudhir (diaDexus) for their support and advice. 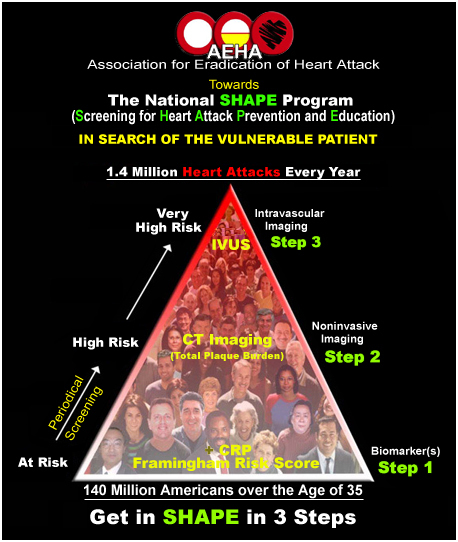 ©2004 Association for Eradication of Heart Attack – AEHA. All Rights Reserved.